LIMINI could be called in to represent Willie Mullins in the Stan James Champion Hurdle at the Cheltenham Festival with the trainer set to discuss supplementing the mare for the race following her impressive win at Punchestown on Wednesday. The market has already spoken favourably about a potential Champion Hurdle challenge for Limini with Coral cutting her to 7-1 (from 10) and Labdrokes to 8-1 (from 12) for the race on March 14. Mullins, and owners Rich and Susannah Ricci, pulled off the same move with Annie Power last year after she had also captured Quevega Mares Hurdle at Punchestown. 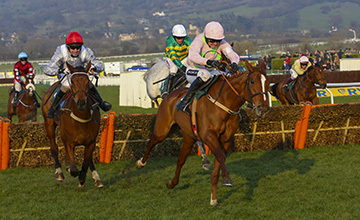 Annie Power, who was filling in for the injured Faugheen, went on to win the Champion Hurdle under Ruby Walsh. Writing in his exclusive Racing Post column, Mullins said: "Limini came out of the race well and we have plenty to ponder. Do we supplement her to the Champion Hurdle or stick to the original plan and go for the OLGB Mares' Hurdle? "It's something I'll be discussing with Rich and Susannah Ricci. We'll have to consider whether her Punchestown win was as good as it looked and it's possible [second] Apple's Jade did not run to her best." He added: "Annie Power was supplemented to the Champion Hurdle after winning the same Punchestown race last year and that paid off handsomely. So we'll see how she is and how the Champion Hurdle is shaping up before making a decision on her festival target." Limini would have to be supplemented for the Champion Hurdle on March 8, six days before the race is run, and jockey Davy Russell thinks it is a bold move that could pay off for Mullins and co.
"She won her race really well [at Punchestown] and looks like a very good mare," he wrote in his Betway blog. "There's now talk of her being supplemented for the Champion Hurdle and she would have a big chance in that race. "The same thing happened with Annie Power 12 months ago and this year's race doesn't look any stronger." Buveur D'Air, who started the season running over fences, is the 3-1 favourite for the Champion Hurdle from Yanworth at 7-2 and Petit Mourchoir at 5-1. Do not miss our exclusive column with trainer Willie Mullins in Saturday's Racing Post - available from 8pm on Friday on the iPad.